Originating in 1934 with Muhammad University of Islam in the home of Sis Clara Muhammad, the wife of the Honorable Elijah Muhammad, the schools underwent a major reorganization in the late 1970's under the leadership of Imam W.D. Mohammed, who reopened them in 1977, and renamed them after his mother, Sister Clara Muhammad. Sister Clara Muhammad Schools serve a predominatly African-American Muslim population although children of all religions and ethnic groups are welcomed to attend. Parents, teachers and students are encouraged to contribute to the staffing and maintenance of the schools and to improve the communities in which they exist. Today, There are numerous Clara Mohammed Schools in the continental United States, plus one in Bermuda. Each of the more than 38 schools nationwide is independently governed and administered, although the curriculum development is centralized. 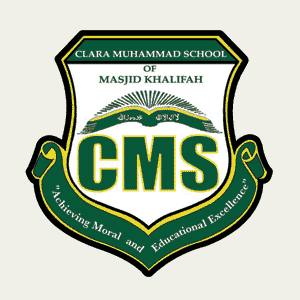 Clara Muhammad School of Masjid Khalifah ("CMS") is a religious-based learning institution with a mission to equip students with skills required to become an integral part of the global community with an emphasis placed on developing in at least 4 areas of intelligences: moral, academic, professional, and financial. At CMS children learn how to show respect for diversity in humanity and cultures.